THE MORE WE are in business, the more this paperless thing makes sense. Yesterday our store printer stopped working. It just stopped. No warning, no sputtering, nothing. This is our fourth printer since we opened the store in 2011. If you aren't good at math, let's just say it's too many. But when you stop and think about it, a small business uses the printer a lot. If a customer makes a purchase with more than a few items, we usually print an itemized receipt. I print a lot of song lyrics and notes for guitar lessons, and a lot of set lists. I keep thinking about getting an iPad or smaller computer for all that stuff - it would save a lot of paper and make things easier. I barely know how to find the "print" thingy on the jimigig. Sheryl is the IT person and puts it all together. I do what I do best - stay outta the way. This morning she managed to resuscitate the old one by cleaning the print thingy. She warned that it may just be a temporary fix, so the new one is standing by and ready if last rites are necessary. For the printer, I mean. Then we'll need to figure out what to do with it. 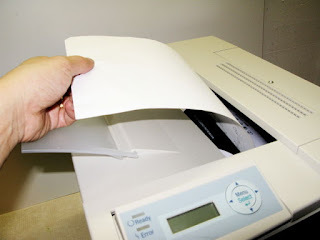 I just noticed you can turn old printers into shredders. Maybe they can be used as tuners or part of a drum kit. Who knows? I'll just press "print" and Sheryl will make sure it works.